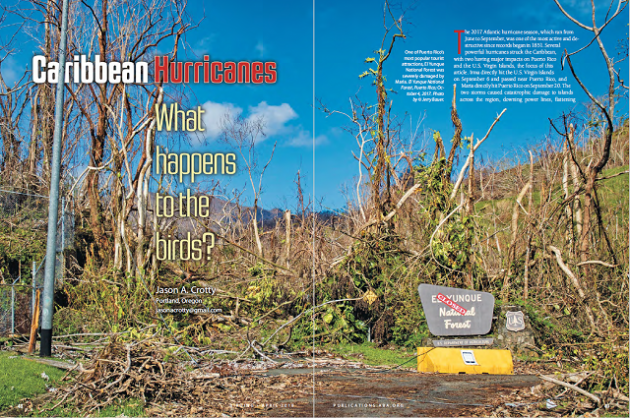 These hurricanes prompted a personal interest in the impact of hurricanes on birds, so I did some research, which ultimately led to an article in the April 2018 issue of Birding magazine. Broadly speaking, most birds appear to survive the initial “direct” effects (e.g., high winds, rain, landslides, and flooding) of hurricanes, but are significantly impacted by the “indirect” effects (e.g., loss of food supplies and roosting sites). But as the months pass, forests and other habitats regenerate and many birds return. Over the longer term, forests mature, closing hurricane-created gaps in the canopy, at least until the inevitable next hurricane. Studying the impact of hurricanes on birds requires data both before and after the event. However, there are few long-term avian studies in the Caribbean. Much of what exists is from Puerto Rico, an American territory where researchers have numerous ongoing investigations, including many studies in El Yunque National Forest. Christmas Bird Counts administered by the National Audubon Society are another source of data. CBCs have been conducted for years in several locations in Puerto Rico, utilizing procedures that can provide comparable “before” and “after” data. The Fajardo CBC has been conducted since 1994. Fajardo is in the northeastern corner of Puerto Rico and the count area includes parts of El Yunque National Forest. There have been two counts since Maria: on December 17, 2017, and December 16, 2018. Thus, there is CBC data from approximately three months and approximately fifteen months after Maria, as well as many years before 2017. The 2017 CBC was conducted just a few months after Maria and forests were still extensively defoliated, with countless felled trees and snapped branches. Some plants had started to re-sprout, but recovery was in the very early stages. Nevertheless, the 2017 CBC tallied 1,934 birds of 82 species, both of which were low counts for past CBCs (e.g., the 2016 CBC had 2,579 birds, 97 species). When corrected for search effort in the field, participant groups found 1.8 species per party hour, a value not much lower than the mean for counts of the previous 10 years and within the range of earlier counts (1.8-2.2). However, they found only 43 individual birds per hour, well below the 10-year mean of 59.6, as well as below the 10-year range (47.7-68.2). Some species experienced dramatic declines. For example, nectarivores (hummingbirds and Bananaquits) showed a significant drop, which was not surprising given the loss of flowers to high winds. Most species of shorebird fell as well. 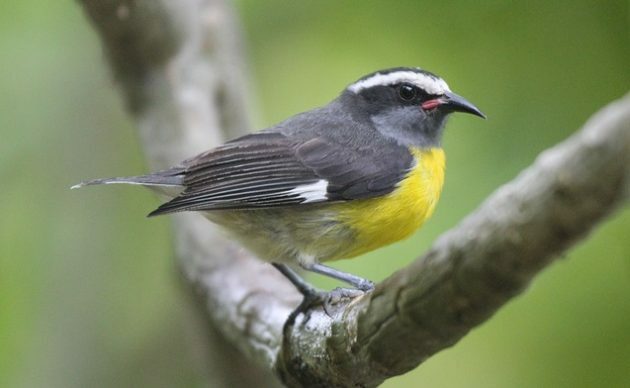 But counts of some species actually increased, including Scaly-naped Pigeon, Red-legged Thrush, Puerto Rican Oriole, and Puerto Rican Tody and other insectivores. Others were essentially unchanged. The causes of these inconsistent results are unclear. Some birds may have had to forage more actively, causing them to be observed more frequently, even if there were fewer birds. And post-hurricane habitats themselves may lead to increased detection, as there are no leaves to obscure the birds. Moreover, because many areas lack a tree canopy altogether, birds that typically spend time high in trees are forced to ground level, where they are more likely to be observed. And numerous birds may cluster around remaining food sources (e.g., Royal Palms for frugivores), increasing the probability of detection. Overall, post-hurricane CBC observers saw birds species at a rate slightly lower than previous counts but far fewer birds overall. By the 2018 CBC, although there were still obvious signs of structural damage in the forests, most foliage had returned. But there were still large gaps in tree canopies that had been closed before the hurricanes. The 2018 CBC tallied 2,492 birds of 87 species. Both numbers were higher than 2017, but still relatively low compared to pre-hurricane counts. When corrected for search effort, participant groups found 2.0 species per party hour, within the range of earlier counts (1.8-2.2). They found 57 individual birds per hour, consistent with the 10-year mean (59.6) and within the 10-year range (47.7-68.2). There were some exceptions. For example, most nectivore numbers continued to be low. Thus, the 2018 CBC suggested that bird populations within the count area were gradually returning to pre-hurricane levels. Indeed, the 2018 count even added two new species: Black-throated Green Warbler and Greater Flamingo. The 2019 Fajardo CBC is tentatively scheduled for December 15, 2019. Although two years of data from a single CBC provides only a sliver of the overall picture, there are grounds to be cautiously optimistic about Puerto Rican birds after Maria and Irma. Moreover, the recovery appears to be largely consistent with those of earlier well-documented hurricanes, such as Hugo in 1989. Scientists are already studying the impact of Irma and Maria, which will further improve our understanding of the impact of hurricanes on Caribbean birds. Already, scientists are finding that the impact of Maria on trees was much more significant than prior storms, likely due to climate change. 2019 is the 50th anniversary of the American Birding Association. One bold celebratory move would be to expand the ABA Area to include Puerto Rico and the U.S. Virgin Islands, which would bring nearly all American citizens into the ABA Area. Thanks to Dr. Joseph M. Wunderle Jr., who wrote a number of the key scientific papers that formed the basis of my Birding article. He also answered questions for a Q&A on the ABA Blog. Dr. Wunderle is a scientist at the International Institute of Tropical Forestry (IITF), a part of the U.S. Forest Service. He is also the compiler for the Fajardo CBC and he graciously provided the data described above. Photo: Bananaquit by Jason Crotty; Birding by American Birding Association.